I saw the tweet and winced, knowing with 100% certainty what had just happened. Another long-time fan and friend of Boloco had run across the new ordering format we have been testing in a few of our locations (currently Hanover, Boston Common, Berklee, Copley and Warwick). She was confused, disoriented and decidedly dissatisfied. She declared publicly she liked the old system better. She’s not not the first to lodge this complaint since we started the test in August 2016. She won’t be the last. This situation stems from nearly 20 years ago when we knew nothing about anything other than we were passionate about burritos and wraps and wanted to start our own business. Opening our first location at the Berklee College of Music in February of 1997, Adam, Gregg, Jason, and I followed the ordering format of Starbucks, our old friends at World Wrapps, Panera, In-N-Out Burger, and many others, even McDonalds. They were the experts. Why reinvent the wheel? A guest enters the restaurant and stands in a line behind other guests waiting to order. The person who takes the order is called a cashier, let’s call him Miguel. Miguel stands in front of a fancy cash register (point-of-sale system, or “POS”), hopefully smiling and ready to help his guests. The next guest in line, let’s call her Maggie, stares at a menu board full of words and adjectives and cute descriptors and tries to decode those words into actual food she wants to allow inside of her stomach. “Big Mac, fries, and a coke.” “Supersize?” “OK.” – McDonald’s. 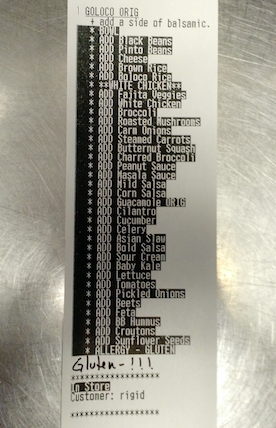 If it’s a simple menu, and Maggie is a simple person, this system of ordering works great. She orders quickly, pays, and waits for someone to make her food or beverage and call her name – while she plays Tetris or WWF or texts her friends. But here’s the problem – at Boloco and many other fast casual joints. Our menu isn’t simple, and neither are many of our customers – especially Maggie, as it turns out. Maggie wants to customize her bowl or burrito or salad. So as things stand today, what does she do? At Boloco, she is forced to do all sorts of “ingredient arithmetic” in her head while simultaneously continuing to stare at an overly wordy menu board with a harried Miguel – our cashier – staring at her. On this particular visit, a reas0nably long line of other customers have gathered and the pressure is on. “Hurry, hurry, hurry…what’s taking so long” you can almost hear the regulars behind her whispering under their breath. For years and years, new customers, experts, industry researchers told us over and over again that it’s just really, really complicated and stressful to order at Boloco. Focus groups revealed many now-die-hard fans had waited up to a year between their first and second visits – “we just didn’t get it”, they said. Meanwhile, the hipsters at Boloco (that’s us a decade – or two – ago) listened, empathized, gave away more free burritos when complaints came in, but honestly couldn’t really imagine making the drastic changes necessary to get it right. Our regulars, who are the experts, and who fought to learn to love us, actually prefer the way we do things now. Why mess with them? They are our core peeps, right? “New people will just have to learn,” we told ourselves, again and again, year after year. To continue, going back to Miguel manning the cash register… remember he is supposed to “deliver an amazing guest experience” 100% of the time. But since every modification that Maggie makes needs to be quickly found and entered into the complicated machine (again, the “POS”) that has a gazillion buttons and screens with endless ingredient options and pricing “if/then statements”, an “amazing guest experience” starts to take a back seat to just getting the order in as accurately as possible. Finally, Maggie and Miguel are done. We take Maggie’s money, and now she’s committed. She won’t leave now that she has paid us… pause here. This one single solitary accomplishment – getting the customer’s money – is one of the main reasons fast food traditionally requires customers to pay first. Once they pay, they’re trapped… they have to wait. People are dishonest, the theory goes… if you don’t take their money first you’ll get screwed. They’ll grab the food and… RUN! Now that Maggie is done – and can’t run – a lot is happening in the background to get her food to her. Miguel’s many finger taps on the POS result in a series of electrical currents that zap information through frayed wires and, like magic, a summary of their conversation shoots a “ticket” to a small box placed near the food line. To the right and below is an example of one of the more outrageous tickets we see. Now enter the “wrappers”, our devoted team members who assemble Maggie’s creation. They proceed to decipher every word and modification on Maggie’s ticket with the intention of getting it exactly right… again and again and again, sometimes up to 300 times per hour during peak business with tickets overflowing and even dropping onto the floor when things get backed up. How often do they get the orders right? Most of the time, actually. But how often do they get it wrong? Unfortunately, enough times that it matters. And it’s not their fault… it’s hard. You (yes, you, reading this) wouldn’t do better, trust me. Panera bread once estimated that they get 90% of their orders right. A 90%! That sounds pretty good. But what of the 10% who got their order wrong? If a restaurant serves 600 guests per day, that means about 60 people had something go wrong. Every day. Over 400 mistakes per week. Over 20,000 per year. And that’s Panera… which touts some of the best systems and training in the business. 90% is unacceptable. Horrible even. Do that long enough, business goes down. One last thing on mistakes – perhaps the most important consideration because most people don’t ever think about it… even when we do get it right at Boloco, ordering from a menu board means that many guests receive something that is different than they expect. Why? Because there was no connection between their eyes and their stomachs as their creation was being assembled. The word “broccoli” is very different on a menu board than actually staring at fresh charred broccoli on the line and deciding in the moment that it looks amazing. And what about a little less of the brown rice, a little more of the pinto beans, substituting mango salsa for corn salsa. I, myself, became a fan of toasted farro only since this test began… before that I thought it should be removed. Seeing the farro in real life waiting to be consumed versus as a word buried on a crowded menu board, I tried it once. Now I add it to nearly everything. Interacting directly with your creator (aka “wrapper”) makes these things possible… it gives the customer full control, allows individual nuances to make their way into the meal. Chances of a mistake, real or perceived, become very, very low. So with that… here’s what we’ve done. No more speaking to cashiers who are staring at computers and tapping a gazillion buttons and calling a manager to help them find a particularly well hidden ingredient. You go right to the person making your food. You make eye contact, so do we. And just like so many other restaurants that focus on customization (Chop’t, Sweetgreen, Dig Inn, Cava, yeah, even Chipotle) we begin making your food on the spot. Of course, you can still order how you always have at the register (”Original Teriyaki Chicken please!”) or just tell them what you want as you go. If you choose to “walk the line”, you get to watch us assemble what you’ve ordered and provide “strategic input” as you wish. Or you can micro manage us to death. We just want you to get exactly what you want. Simple, fast (eventually), adventurous, eye-opening. Eye-opening because you won’t believe the ingredients you never realized Boloco serves that you will want to add to your meal because its so damn easy, obvious and delicious. You get to watch your food being made, every time, no matter what. We won’t make mistakes, because you won’t let us. What you eat will be your own personal creation, from start to finish. All you. In the current test, we’ve simplified pricing to speed things up. Traditionally, there’s a $1-$2 extra charge for our scratch-made guacamole, or a buck to substitute our naturally-raised dark meat chicken for white meat chicken, or $0.75 for our grass-fed steak. It’s not only confusing sometimes, it’s annoying. With wages and benefits now being the highest expense (by design) at Boloco, instead of food (which is still a close 2nd), it’s about time to admit that the cost of serving a burrito is no longer tied to the cost of food as much as it is the cost of taking care of people in a humane way… and doing that does not vary based on what a guest orders within the confines of their delicious tortilla or bowl. So we’ve moved to a one price per size fits all. It speeds things up at the end. No more 50 questions. No more nickel and diming on the extras. Yup, even Guacamole. Even steak. Even white meat chicken. We also went back 10 years and priced out pennies after tax, so while the prices may look funny on a menu board, they will be easier on your wallet with less change when you pay cash. Some of you will notice that a mini size burrito or bowl is more expensive per ounce than it used to be. You will also notice that hardly anybody else in our industry offers such an insultingly small size. That’s because it makes little business sense to offer it in the first place (does Super Size me ring a bell? Now that’s what the smart business people do). Just like a Starbucks short size is only 10 cents less (5%) than a tall size, and yet 33% less beverage, people still opt for the short because it’s the right amount of coffee for them at that moment and in the process they save a little. In our case, you’re still getting a decent amount of food in a mini if that’s what you are looking for, and you save around a buck versus the next size up. We know some will be irked by the higher price per ounce, we hope (wait for it… this might irk you more) some of you might feel good that we have offered it so long at a price that honestly didn’t work for the long term health of Boloco and everything it stands for. Our poor business sense worked in your favor for nearly 8 years. True, but overall wait time is the same and often shorter. It used to be you waited in one line to order and then another line (which often resembles a cattle corral and chute more than a line) to receive your food. Now you wait once. There are times when too many new customers at once or a large order will slow down the line for a minute or two, but it hang in there… it will get back on track. Vegetarians often received a discount versus those of you who ate chicken. Steak lovers paid even more, as did those who prefer white meat chicken. I also know that many vegetarians didn’t opt-in for guac because it was an extra $2… that’s no longer the case and we hope vegetarians will rejoice. Guac is no longer extra. Bottom-line… in our efforts to get to one price fits all (by size), we had to make compromises. What we charge today STILL doesn’t allow us to pay our people what we’d like to pay them. But it’s a step closer. One step at a time. Please stick with us. For those of you truly irritated by the new ordering system, please just use the Kiosks that we just got back up and running in most of our restaurants. They allow you to skip the line entirely. They are pretty easy. And sometimes we sneak in huge discounts just to see if people notice (strangely most people don’t). Better than the kiosks, just use our iOS app or Android app to order as you head to the restaurant. There is simply no better way to do it. That’s all to share on this for now. If you are still annoyed or in WTF Boloco mode, send me an email personally at pepper@boloco.com. This entry was posted in Latest News and tagged change, menu, ordering, service. Bookmark the permalink.